The BDS National Committee (BNC) has declared a long sought-after victory as Alstom lost the bid for the second phase of the Saudi Haramain Railway project, worth $10 billion US dollars, after pressure from the global Boycott, Divestment and Sanctions (BDS) campaign, including effective campaigning from the newly launched KARAMA, a European campaign to Keep Alstom Rail And Metro Away. 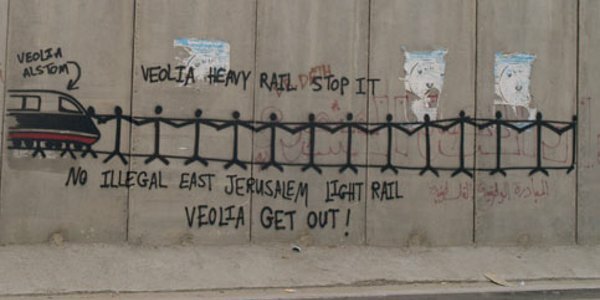 In 2008 the BNC, the largest Palestinian civil society coalition, with partners in Europe and Israel, launched the Derail Veolia and Alstom campaign, due to the two companies’ involvement in Israel’s illegal Jerusalem Light Rail (JLR) project, which explicitly aims to “Judaize Jerusalem,” according to official Israeli statements, by cementing Israel’s hold on the illegal colonial settlements built on occupied Palestinian land in and around Jerusalem. Since then, Veolia has lost more than $12B worth of contracts following boycott activism in Sweden, the UK, Ireland and elsewhere. Alstom, too, suffered substantial blows when the Swedish national pension fund AP7 excluded it from its investment portfolio, after having been excluded from the Dutch ASN Bank due to the company’s involvement in Israel’s occupation of Palestinian land, and has recently announced its intention to withdraw from the project. In commenting on the fierce competition between the Alstom-led consortium and its Spanish-led rival over the second phase of the lucrative Haramain Railway project, Emirati newspaper, Al-Ittihad, referred to "multiple factors" affecting the decision to award the contract, suggesting that political factors may have been taken into consideration. The BNC and several partners have used private and public channels to urge the Saudi leadership to exclude Alstom from the second phase of this large project which will connect by rail Mecca with Medina after Alstom had won the much smaller contract for the first phase. In 2009, BNC member organizations, Stop the Wall and the Civic Coalition to Defend Palestinians' Rights in Jerusalem, have produced in-depth research about Alstom's involvement in Israel's illegal JLR project. Copies were sent to Saudi officials, prompting Palestinian leaders to address Saudi authorities urging them to exclude Alstom from their contracts. *The BDS campaign was started in 2005 by Palestinian civil society. It calls for applying various forms of boycotts against Israel until it meets its obligations under international law and ends its occupation and colonization; ends its system of racial discrimination against Palestinian citizens of Israel, which fits the UN definition of apartheid; and grants Palestinian refugees their right of return in accordance with UN resolution 194.